The most satisfying moment you’ve had in your sport: Qualifying for the Olympic Games at the World Championships in 2015. The most disappointing moment you’ve had in sport: Finishing 4th place in the lightweight single scull at the U23 World Championships in 2012. Aside from racing, what’s the one thing you are most excited to do in Rio: Go swimming on Copacabana beach. Who is your biggest fan? : My mum and dad. Stuck with me through all the highs and lows. When things don’t go right and they’d never think I was at fault. True believers! 6.45: Alarm goes off, breakfast and head to the National Rowing Centre. 7.30: Warm up in the gym. 8am: On the water for the first session. It would usually be a long row or pieces in the first session. 10am: Second breakfast. I don’t think I ever want anything other than a hearty bowl of porridge at this point. 11.30: Second session. Either on the water or in the gym. 2.30: Third session. Again either on the water or in the gym. Some days we have three sessions, some days we have two, depends on the training program. 5pm: I’ll get home and might do some work on my laptop. I have a part time engineering job carrying out research for a Wave Energy Developer, Jospa Ltd.
6.30pm: Dinner time. No matter what it is it usually contains a lot of meat and vegetables. 7.30pm: Chill out for the evening, I would either call around to friends or go to the cinema, nothing that requires too much energy. 10pm: Try and have lights out for 10, rarely happens but I try! Favourite training session: Long pieces on the water. I’m better over longer distances and you always feel satisfied for the day after a hard session. Hidden talent: Coloring by numbers. How do you keep nerves at bay on race day: Just focus on what I have to do at that moment in time and not think too far ahead. The thing I miss most when I am training is: Sleeping. The most inspirational thing a coach has said to you: You know how to get what you want so get what you want! Advice I would give a novice/beginner now: Enjoy it. Even when it’s scary or nerve wrecking stop and remind yourself to enjoy it. I wish someone had told me sooner that: You can get two Malteaser bunnies for a euro in the shop around the corner. How would your teammates describe you: I don’t know…I should ask them. Biggest fear: Bringing the wrong one piece on the morning of the Olympic final. Who is your hero? Leonora Kennedy. 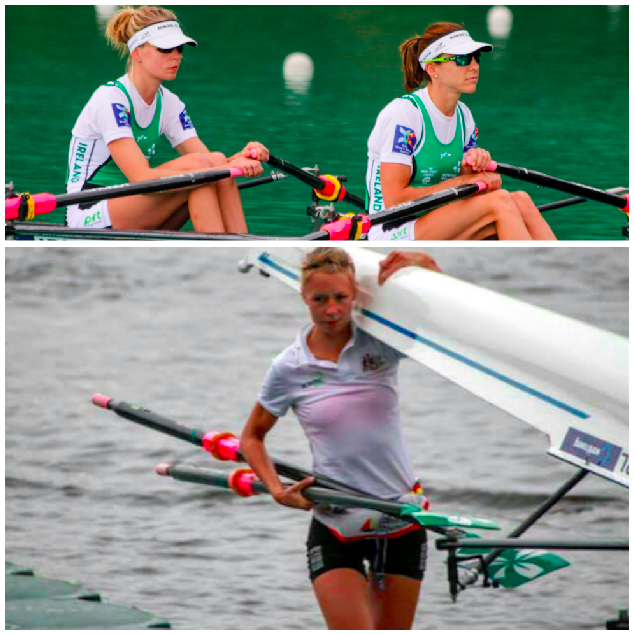 The Enniskillen woman in Ireland’s Women’s Pair. She has the best advice in any situation. She has been such a rock for me. Her determination and grit is enough to inspire you to push through any hard times. Perfect day off: Lie in, breakfast in my favourite cafe in Cork, the Bookshelf on South Mall. Then a nice walk out in Ballycotton or Kinsale or another beautiful Cork spot…..and finish with dinner with friends.